Veteran digital journalist Doree Shafrir’s debut novel, Startup, explores the world she has worked within and written about. A former Gawker employee, Shafrir now works at Buzzfeed, companies representing two distinct generations of dotcom media companies. 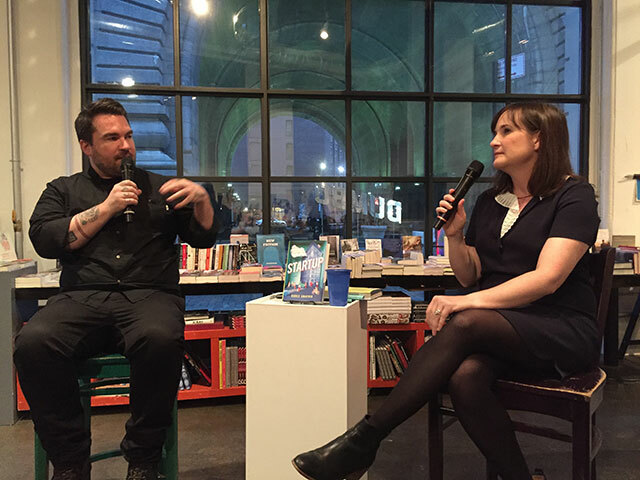 She was joined by Buzzfeed Books Editor Isaac Fitzgerald at Powerhouse for a discussion of the book, the digital industry, and journalism. A lot of tech companies are dominated by people in their twenties, Shafrir explains, adding that she believes they end up missing out on knowledge by not hiring people in their thirties. Shafrir is in her late thirties, and says she feels like a fish out of water many times, though she didn’t feel quite as alienated as her protagonist, Sabrina. The novel is written from the perspectives of three characters. Mack owns a new tech app, TakeOff — Shafrir describes him as a typical tech-bro who believes he will change the world. Katya, a young tech journalist is faced with meeting new rubrics at her job as a tech journalist; while she was great at driving traffic, now her supervisors want to see engagement. And finally, Sabrina, a writer and mother of two, is trying to adapt to the younger workforce. The New York City tech scene has always intrigued Shafrir. As a journalist, she wrote a 2010 article about the growth of New York City’s nascent technology sector. Way back then, a strong tech economy was still just a dream of a billionaire technocratic mayor. The way the tech sector navigated the New York City scene fascinated her. It was a new industry amongst stalwarts like Wall Street, fashion, advertising. The city’s other industries didn’t take the technology workers very seriously. Meanwhile, the tech workers also had a chip on their shoulder because they were neither Silicon Valley nor were they a traditional New York City industry. Shafrir’s career as a technology journalist has vacillated between digital and print media, switching sides as necessary. When she started with Buzzfeed, she felt she was part of the technology economy. “I really felt I was in the thick of it,” she explains. During her career, Shafrir has worked for newspapers like the New York Observer, which struggled to modernize. Shafrir’s beat was “ideas.” She also worked for the digital iteration of Rolling Stone as they worked towards creating an online presence. She describes the hectic writing schedule there as one where editors would always say yes to whether they were covering a story — it was about writing volume and quantity. As print made the transition to first generation online publications, and then as those evolved, there was always a challenge to understand how success was determined and quantified. Search engine optimization, traffic statistics and engagement were all considered important goals, but few editors provided guidelines on how those were measured. Buzzfeed felt like an opportunity to grow something Shafrir explains. Now she is accustomed to adapting and changing, and learning to change how she is evaluated. Earlier in her career, Shafrir was responsible for covering the tech party scene. The technology companies, looking to create their identity in the crowded New York City business community, hosted events and invited reporters. Everything at these types of parties is on the record for journalists, though not everyone seems to know that. At one party, Shafrir was at a fancy apartment on Fifth Avenue taking what she describes as “creep shots” of things in the home. The photos ran alongside the article. She also spoke with somebody’s secretary who let loose some secrets. Shafrir got an email from the woman saying she felt betrayed because the comments went into the article. But those comments were on the record, and at the time it seemed much more important to publish the truth than worry about anyones feelings. Shafrir says that both Sabrina and Katya have traces of her in them. Mack does not. She did, however, meet with a dozen tech CEOs for off the record background. In writing the character, she knew Mack needed empathy, she just wasn’t sure where to find it. She didn’t want him to be dismissable. “I think one thing you learn as a journalist is empathy,” she says. Most people are not a hundred percent bad. To render a character honestly, a writer can’t make a character all “dickish.” The app Mack develops is a total invasion of privacy. It reads everything a user writes and receives. It was intended to make people more productive at work. He sees himself as doing good, and he needed that complexity in his character. Although Shafrir acknowledges there are plenty of things in the technology world that are problematic, generally she thinks tech has changed the world for the better. Sexual harassment is a central plot point in the novel. There are a number of high profile silicon valley cases that represent an ongoing problem in the industry, though at the time Shafrir wondered if those cases would wrap up before she finished writing the book. As the continuing revelations at startups like Uber reveal, the problem has not been solved. Shafrir began the book in 2014. She had become an editor and wasn’t writing regularly. She decided she needed her own project, and set aside thirty minutes a day for a month to see what would happen. By the time her experimental month was over, she had sixty pages. Writing about technology in a novel length work is challenging because of how quickly the tech catches up. Some of the apps that she invented for the book were created and launched between the time she wrote the book and the time it went to publish. In some cases, she wrote about things that no longer exist, like Vine, a video sharing app. She was trying to preserve the novel’s timelessness. “You can drive yourself crazy,” she says.